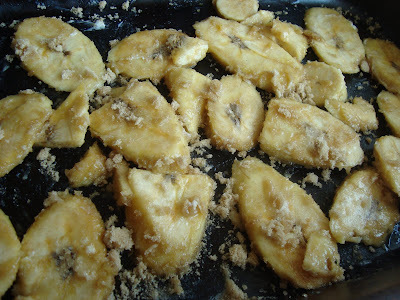 I made the following recipe using this random plantain I had on hand. It was given to me by my mother in law to try caramelizing it while it was still green. However, I let it sit a little too long that it ripened up and needed to be used quickly. So I continued the plan to caramelized it (since my mom made the dish using only ripened plantains) and it was perfectly sweet. 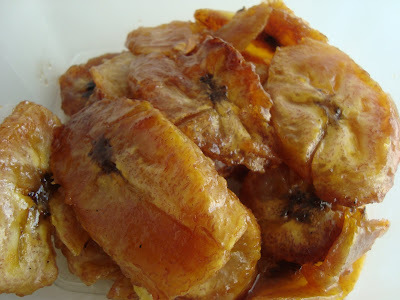 I still have yet to try caramelizing green plantains using the same recipe... so if you do try it, please let me know what you think! Bake in the preheated oven for 20 minutes until it turns slighty browned and sugar has caramelized. Remove from oven and allow to cool slightly before serving. I love plantains, so this sounds awesome!